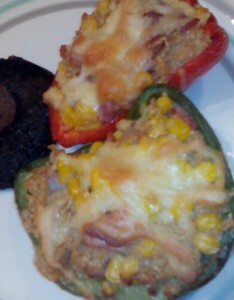 I love a good stuffed pepper! Peppers are a great source of nutrients such as vitamin C and fibre. This recipe uses couscous instead of rice (which you may have used in stuffed peppers previously). Couscous is so quick to prepare – pour boiling water or stock onto your dried couscous, cover, and it cooks in 5-7 minutes just by soaking in the water. No hob required. I often use couscous as an alternative to rice because it’s so quick and convenient – which is especially important as a busy working mum. It’s also cheap (no expensive packets of pre-spiced couscous required – I pay approx £1 for 500g box and make my own). My kids love it too, which is a bonus. This recipe would work perfectly served as a main course with added vegetables or salad. 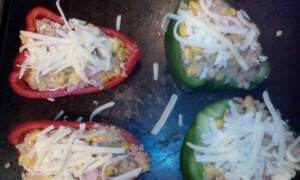 Alternatively, you could serve 1/2 pepper per person (i.e. make this recipe go four ways) for your next dinner party. I have included nutritional content at the end of this blog, as well as recipe variations you may wish to try.